Security researchers discovered a new impostor virus called WhyCryransomware that encrypts user data and uses the .whycry extension to mark the processed files. It is made by a hacker collective known as the Cyber-Ghost-Army and it can be effectively deleted from infected machines by following our in-dpeth removal guide. How Does WhyCry Ransomware Infiltrate the System? WhyCry ransomware can be distributed using different methods depending on the targets and the chosen scale of attack. Email spam messages that employ social engineering methods – specially created template-based emails are created that pose as being sent by popular companies. The WhyCry ransomware is attached directly to the messages or linked in the body contents. WhyCry ransomware is placed in a single executable binary file that can be hosted on hacked or hacker-controlled download sites. P2P networks like BitTorrent are another possible source of infections. In the last few years computer hackers also utilize infected software installers and office documents containing scripts that link to them. Web redirects and malicious browser add-ons (also known as hijackers) can also be used to spread the dangerous virus. The WhyCry ransomware was recently detected in an attack wave that carried the new threat. During the initial analysis the experts concluded that the virus is made by a hacker collective known as “Cyber-Ghost-Army” and that it contains code from other simple ransomware threats. A possible scenario is that the hackers have taken various snippets from hacker forums and constructed the virus based on that core. At the moment the collected WhyCry ransomware samples are still in an early development phase and contain only the encryption engine. Like other similar malware it uses a predefined list of target file type extensions The criminals behind the WhyCry virus can configure it depending on the targets. In most cases the hackers seek to impact the most commonly used data: archives, documents, music, photos, videos, configuration files, databases, backups and etc. All files have been Encrypted by Why-Cry! Don’t close the PC otherwise, I wont be responsible if your files dont decrypt. 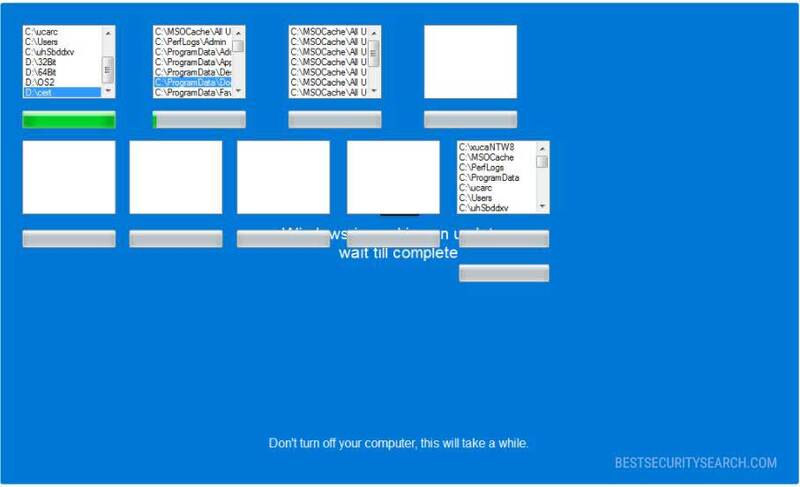 If you close your PC this screen will be removed. And you will not be able to Decrypt files back!!! Warning: Do not turn off your Computer!! You will loose all your files! 2.) Buy Bitcoins worth of $300. 3.) Send $300 in Bitcoin to Given Address Below! 4.) You will get your Decryption Key after you pay $300 in Bitcoin. 5.) The Decryption Key will pop up on the left side automatically. We are more advance than others. 6.) Enter it in Given Box and Click on Decrypt. 7.) After clicking on Decrypt the files will start decrypting in background. 8.) As soon as files are decrypted this screen will remove itself. 9.) You will get all of your files safely. Your Files Have Been Successfully Decrypted!!! The graphics and text look incomplete. We expect that updated versions of the WhyCry ransomware are going to employ an improved lockscreen. The criminals demand a ransomware fee of 300 US Dollars payable in the Bitcoin digital currency. The payment needs to be done directly to the WhyCry virus operators via the supplied address. We once again warn all users not to pay the hackers. They can eliminate the active infections and restore their computers by using a quality anti-spyware solution. File recovery is possible with the use of a quality data recovery product. Refer to our instructions below for details. WARNING! Manual removal of WhyCry Ransomware requires being familiar with system files and registries. Removing important data accidentally can lead to permanent system damage. If you don’t feel comfortable with manual instructions, download a powerful anti-malware tool that will scan your system for malware and clean it safely for you. WARNING! All files and objects associated with WhyCry Ransomware should be removed from the infected PC before any data recovery attempts. Otherwise the virus may encrypt restored files. Furthermore, a backup of all encrypted files stored on external media is highly recommendable.